Following careful consideration for work and for the family, we had decided to make a move to the Far East. This is somewhat an organic development, yet again, but as we looked at new career opportunities, this seemed to be the next move for us. My PhD research project requires me to be in China for fieldwork to study mothers for a significant period, which would have been quite impossible for the family to be away from each other for so long. Further, the time has come whether we wanted Audrey to receive a Chinese education. This has always been a delicate spot for me, as I have discussed our recent naturalisation to become British citizens, it’s challenging to teach what it means to be Chinese in a foreign context. I have found it very difficult to make her speak the language and not to mention writing the Chinese characters. My husband Jeff is still experiencing the same frustration as a third generation Chinese American from the mid-west. Assimilation was important for my parents-in-law, so bringing him up in the 70’s means speaking mostly English in the household (sometimes mixed with a myriad of Chinese dialects in the presence of other relatives as they are from different parts of the Motherland). After Audrey turned 2, it was impossible to get her speak the language. She even told me off whilst trying to speak Chinese to her in public once, recently, as “no one understands what you are talking about, Mummy!” Perhaps it’s me being self-conscious, but I feel I always need to explain myself when I speak to Audrey in Cantonese in the public space. T the more I get asked, the more self-aware I have become which seems to be dissimilar to our European friends who seem to converse in their native tongue with much pride. So the time has come whether we should make a move to a Chinese environment. It could not have been later as once they begin learning to write from 4 years and it would have been difficult to catch up afterwards. There are Chinese schools in London, but they now mostly teach Mandarin, which although is the official language in China, it is not my mother tongue and most of our Cantonese families would not be able to speak it fluently. Cantonese is not a language but a dialect which has become important for Hong Kong as most of us have some kind of Cantonese root in the family. Verbally, it contains 6-9 intonations and thus makes it very difficult to learn, compared to Mandarin. Politically, because traditional characters are still used officially in Hong Kong (same as Macau and Taiwan), it is seen as a local resistance to the Communist propaganda which used simplified characters – a movement to increase the literary rates in China following the collapse of the Tsing dynasty. Each traditional character contains more strokes than most simplified characters, however there is much more meaning too and somehow easier to learn because many words are derived from the shape or similar sounds of the objects. So with an amalgamation of these factors plus the go ahead from Jeff’s boss on his request to relocate which took a good 18 months, we have decided to give Hong Kong a go. We are very aware of this urban craziness and so, have decided to move into one of the outlying islands called Lantau for the space and peace from the city. It is popular with expatriates and still thrives some of Hong Kong’s indigenous villages. Our daily commute is longer, but being privileged to have a car with a free parking space, we could drive into the city under an hour as a family and escape into the nature to enjoy the landscape which the archipelago has to offer. Having now returned after more than a decade, I have found myself navigating between an expatriate mindset (being married to one is probably a main reason), and my awareness as a local Hong Kong person. I am now more sensitive to the tiniest things in our surroundings, and try to take time to observe and notice the differences. 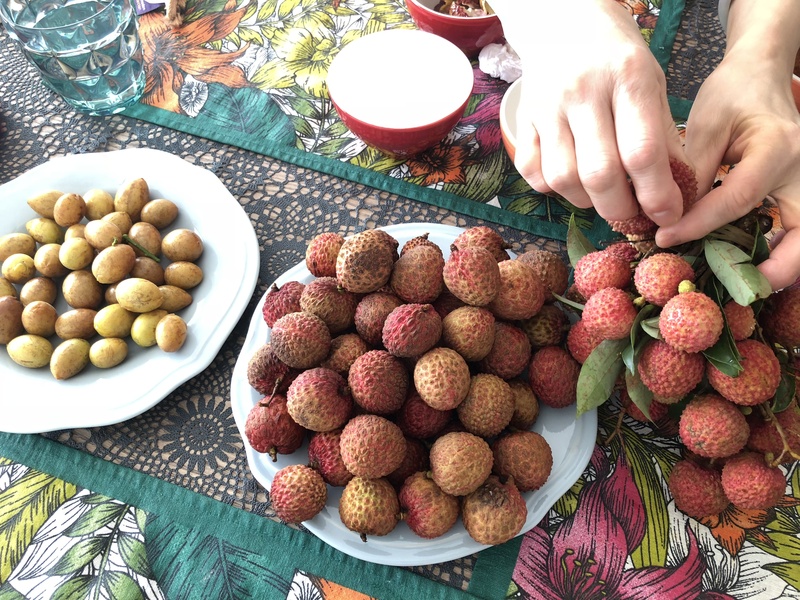 I have dedicated this post (on some quick random ramblings) to some of my favourite local summer fruit – lychees and wong pei (yellow skin). I have fond memories of picking them when I was younger at my grandmother’s house in Sai Kung and have found these in season at our local wet markets. When we visited my grandmother in her death bed at the hospital for the last time before she passed away last summer, as with every conversation I had with her in the years gone, she would ask us to move back to Hong Kong as this is where the family is. Here we are, a year later, eating wong pei-s in our new home.